Currently, Japan is facing many social issues such as declining birth rate and aging population, increasing regional disparity, labor shortage, increasing vacant houses, shortage of inbound tourist accommodations and so on. In order to deal with these issues, governmental bodies like Ministry of Land, Infrastructure, Transport and Tourism (MLIT), Ministry of Health, Labour and Welfare (MHLW) and Ministry of Internal Affairs and Communications (MIC) have adopted various policies and measures. TEKUTO has been striving to tackle these social issues through architecture. The projects utilizing “kominka” (traditional folk houses) such as Denpaku and Ethiopia Millennium Pavilion, organizing a study group on eldercare facilities, conducting a study on resort facilities are some examples of such efforts. 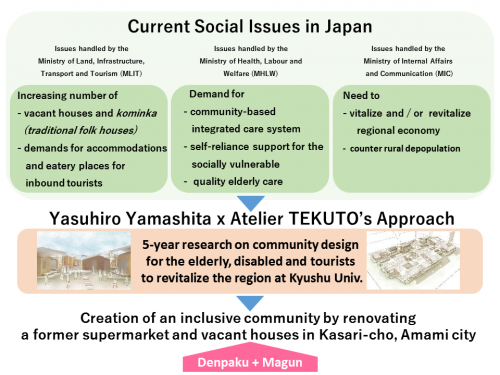 Moreover, TEKUTO’s founder and principal architect Yasuhiro Yamashita has been a visiting professor at Kyushu University for five years, teaching a course of town planning for the elderly, people with disabilities and tourists that invigorates the local economy. These commitments eventually culminated in the creation of Denpaku + Magun that opened in July 2018. The source of inspiration that instigated this pursuit was Yamashita’s encounter with a certain town in Germany.